With a deceptively jaunty beat — Simone jokes that it’s a “showtune but the show hasn’t been written for it yet.” — “Mississippi Goddamn” is absolutely unsparing in both its beauty and its fury. As the drums keep up a jazzy double-time, Simone worries about being killed herself, rails against having to act white just to get by, and even feels abandoned by god. 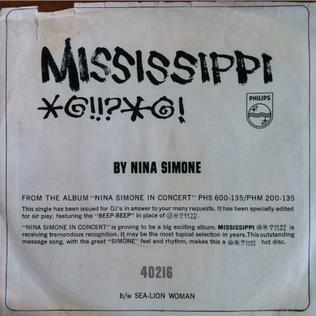 With her band chiming in on the “do it slow!” like they don’t quite believe making fun of incremental progress is the answer, “Mississippi Goddamn” also illustrates the tensions that she’s singing about: she’s ready to charge forward and try to go get the equality she wants, but they aren’t so sure. That all of this righteousness was sprung upon a primarily white — and no doubt mostly self-styled liberal — audience in 1964 is all the more amazing, and you can hear the audience reacting a lot to her “I mean every word” interjection at the beginning, a little less at the “show tune” joke and not at all when she asks later on if they thought she was kidding. Because by that time, even the thickest of them had realized that she wasn’t.